WindWalkers is thankful for a supportive community that enables us to expand our well known equine assisted programming for anyone that wishes to participate. WindWalkers' programs welcome individuals of all ages, backgrounds and a wide variety of challenges-from a 3year old with spina- bifida to group lessons for young adults with Down syndrome to working with teens-at-risk or an elderly person recovering from a stroke. As you may know, WindWalkers has grown tremendously in the number of people we serve and in the innovation and reach of our programs over our 10 years in service to the Roaring Fork Valley. 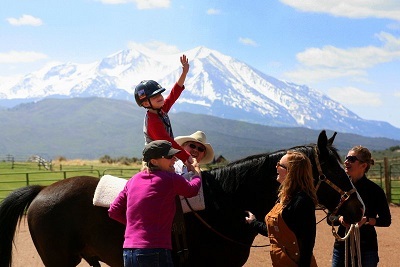 Yet, demand continues to grow for our therapeutic riding, all- inclusive summer camps and EAP in which we address mental health and human development needs, as well as our ability to serve our seniors and veterans. In answer to the communities' needs, we have increased our land holding, our staff, and our herd. 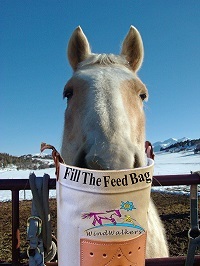 Therefore, we are writing to invite you to become a new donor today with a gift at any level by contributing to our annual, "Fill the Feedbag" Challenge Match. The plan to expand our services is a comprehensive set of programs, initiatives, and policies that will increase physical activity, promote self-sufficiency and build critical life skills in a fun and safe place. This Plan is being supported by an anonymous donor who will match our efforts to raise $30,000 in 30 days-dollar for dollar. With the cost of programs increasing year to year and with government funding decreasing and normal donor attrition, WindWalkers needs the support of new donors like you more than ever. It is only with new donors that we can continue to offer high quality equine assisted therapies to those in need. Thank you for your consideration in advance! "Sam has exceeded all predictions the doctors outlined for him when he was diagnosed. He learned to walk early, and the doctors said he might not walk at all. He has developed amazing core body strength and has better balance and coordination. 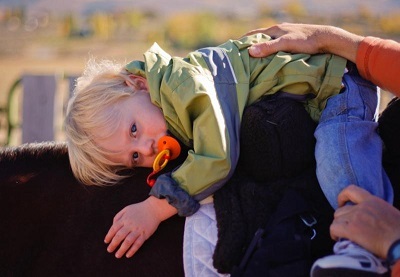 He communicates using sign language and occasionally says a word or two like 'more, please' when he's riding a horse and doesn't want to stop." --Sam, now 6 years old, has Angelman's Syndrome, started at WindWalkers at the early age of 18 months. or visit us at www.windwalkerstrc.org and "Donate Now"!